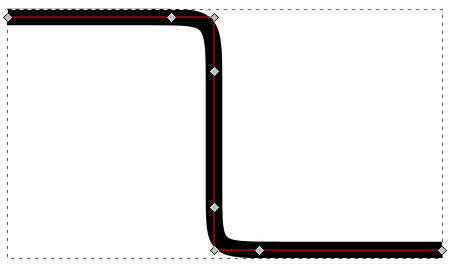 I am trying to use Inkscape to draw a path consisting of line segments, where the corners are rounded, like the bold black arrows in this image. I tried the Bezier tool, but couldn't achieve the desired effect. Any advice? Hold down CTRL as you use the tool. This will help you constrain the paths to straight horizontal/vertical/diagonal lines. This is where you need to place your nodes. You need three nodes like this for each corner. 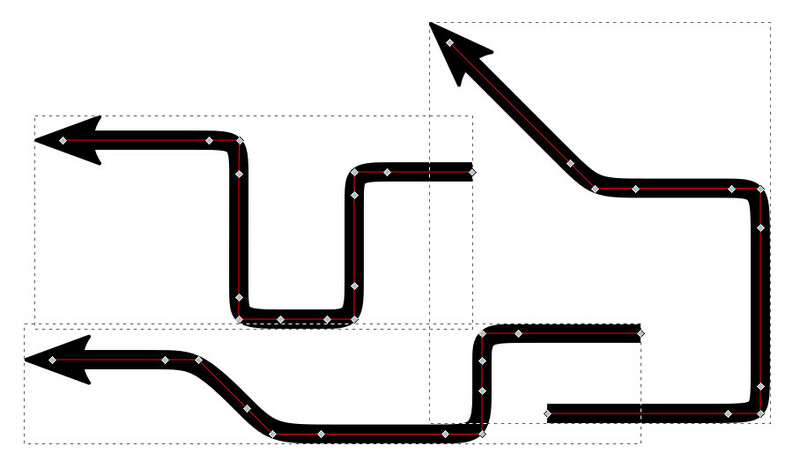 The Bezier tool will make the curves you need automatically when in BSpline Path mode. Take a look at this post - it seems there is some functionality in the development release that may help - path...path effects...fillet/chamfer. How to snap end points of straight lines to form connected triangles? How to create a vector pattern with arbitrary sized/rotated objects? How to draw a curved triangle with curved inner corners?